The main questions I always get are “how are you sleeping?” “is he sleeping through the night?” well, these are very tricky questions as it really varies on your baby. I’m definitely no sleep master and I don’t have the sleep miracle recipe but I’ve found that a couple of things have helped me along the way. Do you always have to wake them up? That depends on their birth weight and what your pediatrician recommends. In France, they don’t usually wake babies up whereas in America it’s a very common thing. If Oliver was born as a 9lbs baby…no I would’ve not woken him up as long as I knew for a fact that he got his full feedings during the day. Although some babies who sleep a little further from the mom, especially if you’re breastfeeding, can be deep sleepers and at the beginning are not be able to get the energy to wake up even though they’re hungry. You will get to know your baby’s needs. Even though I checked all the possible discomfort or needs, he still wouldn’t sleep for more than 15 minutes at a time unless I held him. Maybe I wasn’t swaddling him correctly? I’m not sure but the one thing I’ve learned is that I tried everything that I was recommended to do and ended up having to tweak a few things here and there. It’s incredible how similar babies are and yet so different! As a new mom it was very stressful for me to grasp the idea that some things work for my baby and some don’t. A week into it, I was such a zombie, I had never felt sleep deprivation that intense in my life. I remember one night feeding him on the rocking chair and all of a sudden just feeling my head fall forward.I had completely fallen asleep and it freaked me out just the thought that I could’ve dropped him. So, enough was enough, obviously something was not working. I unswaddled him and laid him next to me. That was my first “successful” night where I was able to sleep in a three-hour increment. Oliver wanted to stay near us and In a way that seemed to be the most natural thing to do. Why do you have to swaddle a baby? You swaddle a baby so they can be tight and comfy just like in your tummy because that’s all they know. Also, they don’t know how to deal with their little arms and they get startled in their sleep and it can wake them up. Not all babies like to be swaddled and some babies like to have their arms out. I just learned to observe Oliver and understand that babies are all different! This is a very powerful article on Time Magazine about the pressure of being a mother in a society where everyone has an opinion or an advice. This blog is merely my experience with the knowledge and understanding that we’re all different. if you’d like to read click here. what is white noise? White noise is a sound that mimics your tummy. it sounds like constant “shhhh.” Some can also mimic your heart beat. There’s cute stuffed animals or even playlists that can play white noise. Aren’t you scared to roll over him when you sleep? I don’t move when I sleep, I guess it’s my luck but you can get the Dockatot if you to co-sleep at ease. Eventually, co-sleeping worked for me and Oliver. I certainly didn’t plan it and it definitely took an adjustment but I love it! I remember when he was really little, he’d make all these noises and I had read that newborns are loud! he would move his little head side to side and I was horrified and thought “omg! he’s waking up, don’t move Julie! don’t even breathe” haha when actually he was just self soothing himself to sleep! At about two months, I started implementing a night routine, every night I’d give him a bath at 6pm and bed by 7pm. Babies love routines, they crave it. The bath had become a symbolization of “this is nighttime, time to go sleep.” It also helped me a lot in having him differentiate day/night. Because I’m not into the crying out method, I would feed him and then rub his nose and his back till he fell asleep. I’d position him in his favorite position which is on lying on his side and I go with his flow, letting him soothe himself but also letting him know that I’m right here, that he’s ok. At first, we battled a bit but now till this day, I don’t rock him at night unless of course he’s really upset. I have the patience doing that and I enjoy these moments with him. That whole scenario saved me a lot of energy and it gave Kyle and I some personal time to look forward after 7pm came around. Although I’m not going to lie, the first few months, all I could obsess about was sleep so I went to bed by 8pm. Oliver usually had a 4 hour sleep window from the moment he fell asleep and these straight hours of sleep were delicious. I also would sleep when he slept during his naps. I also haven’t been able to drink caffeine as I’m breastfeeding and Oliver is super sensitive to it, that’s been very tough to say the least but I’m amazed at how my body eventually created natural energy and mommying eventually got easier! Here are some books that I remember rushing Kyle to the book store a few days later coming home with Oliver and just feeling clueless! my two favs were: The happy sleeper and the Womanly art breastfeeding by La leche League. Once he got a little older, I started having a morning routine. 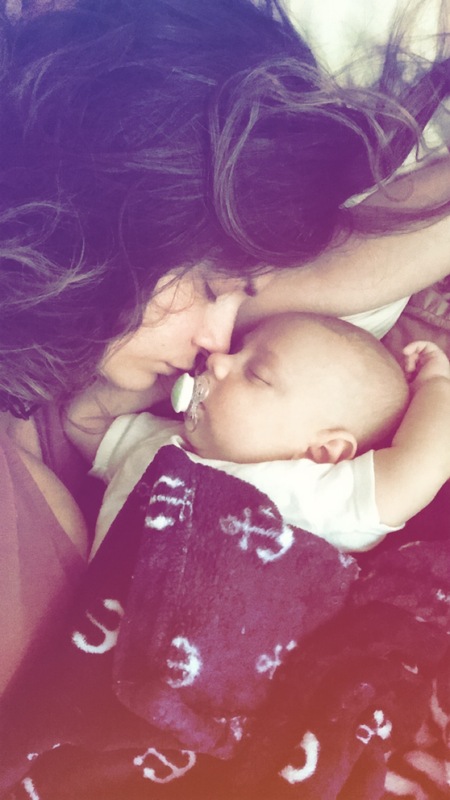 I think the hardest part is to get your baby sleep through the night and not wake up at the crack of dawn…it’s challenging and momma you’re not alone!!!! Now, he started naturally waking up by 7:30 because he realized we’re not moving any time before! I remember when he was younger, he would wake up at 4:00 am and I was just be like “nope buddy we’re not starting the day now! no way!” and I’d try everything to put him to sleep…back rub, nose rub, shhhhh, rocking…you name it! It was most of the time successful! one thing I’ve learned is that I always believe and trust that he’ll fall back asleep…If I go in the situation with negative thoughts and all myself “He’ll never sleep.” it’s not going to happen, not healthy and more stressful. Another thing is that at the beginning, they’re all over the place and you just have to accept that. I realized that I’d find myself trying to rock him to sleep because I was the one dying to sleep! wishful thinking! You’re better off going with your baby’s flow until he understands the world a little better! Patience! Now Oliver is dead on with a schedule, of course it changes time to time because these little creatures are unpredictable but I can have a pretty good idea on what to expect for him and I throughout the day. How did you set a schedule for your baby? I think I’ve set a schedule with him by instinctively and naturally observe my baby and meet his needs. Little by little I started seeing a pattern and sometimes I’d ease him into preparing him for a nap because of what seemed to be his previous behavior on other days. I’m very careful with not leaving him with negative feelings or anxiety about certain things. I don’t let him cry to sleep and I’m consistent on how I do things so he knows what to expect. I think that’s why he’s fairly been an easy, gentle baby. Let me know if you have any questions and I hope this helps!!!!! !